In 1868 a huge programme of restoring and improving St. John the Baptist Church in Ruyton XI Towns was instigated by the Vicar, Rev. Frederick Paget Wilkinson. The re-opening of the Church after all the work was completed, was indeed a grand affair. The Church is dedicated to St John the Baptist. It is of Norman foundation, the chancel of that date remaining almost entire. The building originally consisted of a nave and chancel only; subsequentaly a narrow aisle was added to the north, the arcade of which is one of the most singularly made specimens of construction extant. In the sixteenth century, a very fine tower was added to the west and within the last half century the narrow north aisle gave place to a very capacious addition, nearly equal in area to the nave of the church. Later still the present Vicar has restored, re-roofed, and refitted the chancel, and has now effected the same improvements to the rest of the church, lowering the floor to one of the old pavements (one still older having been found some inches below) re-paving, reseating with oak, warming with hot water, and generally improving the structure. It must also be mentioned that the fine peal of six bells which have been fixed in the tower were procured through the efforts of the Vicar. Further efforts are required to re-cast the very ugly porch and to clear away the earth from the walls of the building. The whole of the work has been carried out in a most satisfactory manner under the superintendence of Mr. Pountney-Smith, architect, Shrewsbury. A new window, which has been inserted in the south wall in the Baptistry bay of the church, contains a very good specimen of storied stained glass. It is the gift of a kind benefactor, and as supplied by the local artists, Messrs.Done and Davies, of Shrewsbury. The subject on the left hand opening represents “The Baptism“. Between the bottom of the subject and the small base of rich Mosaic stained glass at the bottom of the window, is an inscription relating to the subject,--“Thus it becometh us to fulfill all righteousness”. In the right hand opening is a design taken from the left “Suffer little children to come unto me “. On the right hand of our Savior is the mother with two other of her children. Above each of the subjects is a canopy. In the quatrefoil above the heads are introduced the lily and the passion flower. The colouring of the whole is very beautiful and the drawing bold; and in all respects really excellent. The same firm has also filled the large west window with grisailled glass, with richly stained border all round. In the tracery of the window are the figures of our Savior, and the patron saint of the Church, St John the Baptist. The window is of excellent design and very effective, while the price is so low as to render it especially suitable when cheapness is an object. The cost of the restoration is from �0 to �00, The nave has been restored, and a great portion of the interior re-seated with open pews of strong oak. The Gallery has also been removed. There is also a new and elegantly-designed Font, by Percival, the carvings on which have been most chastely and elaborately executed. 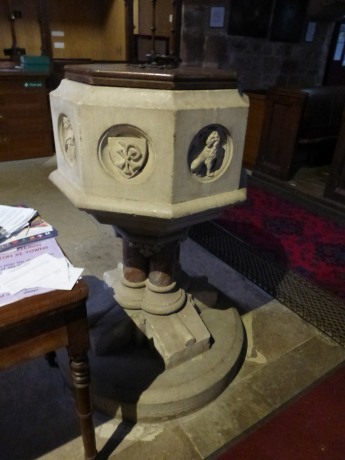 The base or platform is of York stone with coloured marble pedestal, surmounted by the Font in Bath stone, and on which is carved the monogram “I.H.S.” and four symbolic representations of the Four Evangelists. This beautiful Font is the gift of Mr. Walford. There is a beautiful chancel organ built by Bevington, London which has been erected by Mr. Norris, of the same firm, who presided very efficiently. It is of the over-hanging style and possesses six stops—open diapason stop diapason, treble and bass, principal dulciana, bourdon and prepared for mixture speaking front, decorated pipes and has an octave and a half of pedals , Immediately in front is the very appropriate inscription “ Let everything that has breath praise the Lord “. 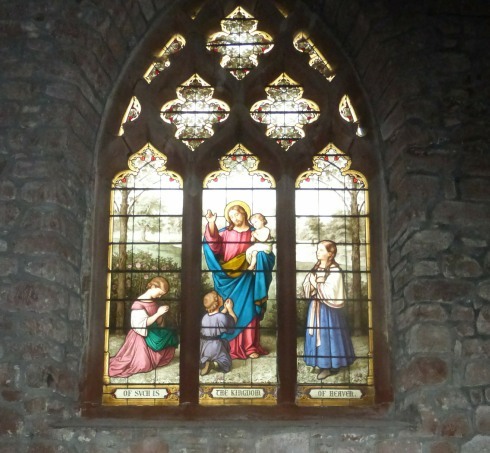 The Church also contains several beautiful stained and painted glass windows one very fine one being “Christ blessing little children “underneath which is the inscription “Of such is the Kingdom of Heaven “. The Hunt Window. The church has been most tastefully decorated with flowers, evergreens, ears of corn and other emblems of harvest time. At the entrance were two illustrated texts in red letters, white ground and green borders “Peace be within thy walls .and prosperity within thy palaces” and The Lord is in His holy temple “The chandeliers in the aisle were also draped with flowers. The decorations reached their climax at the altar underneath the beautiful East window, the subject of which latter is “The Crucifixion”. Underneath the painting, in the window-sill, was a sheaf of corn and a little below that was a richly executed “Cross” on a white ground, with a scarlet border, enriched with some green tracery. Halfway up the cloth on the communion table was another beautifully worked “Cross”. The windows all around the church were also decorated with flowers and evergreens. About half-past eleven the clergy entered the church in procession, wearing their surplices and hoods and chanting the processional hymn “We love the place O’God “The service was a full choral one, Tallis being used throughout. (Thomas Tallis was a 16th Century composer of choral music.) After the service the Recessional Hymn “Oft is the danger, oft is the woe” was chanted by the clergy on leaving the Church. The voluntary played as the congregation was leaving was the “Offertorie”. The sermon was preached by the Rev. Charles Orlando Kenyon, Rural Dean, “ For where two or three are gathered together in my name, there am I in the midst of them “ He said the object of their assembling together that day was twofold , the first being to thank God who had enabled them to restore their Church and the second was to thank God for giving them so bountiful a Harvest in the somewhat exceptional season which they had passed for lack of rain . After the sermon a collection was made for the restoration Fund. Took place in a tent which had been tastefully decorated for the occasion with mottoes, flags, banners and floral decorations. At 2 O’clock almost two hundred ladies and gentlemen sat down to an excellent luncheon provided by Mr. and Mrs. Benbow of the Admiral Benbow Inn , and under the Presidency of J.R.Kenyon,Esq,Q.C.,supported on his right and left by the Rev.F.P.Wilkinson,Vicar of Ruyton; Rev.W.Jones.Baschurch; D.F.Atcherley.Eq.Marton Hall; Colonel Kenyon Slayney; Rev N.Cooper. J.Humphreys.Esq.Hanley Hall; Rev C.O.Kenyon. Rev.E.W.O.Bridgeman. Rev.P.G.Bentley & co.
Mr Minton proposed the Bishop and Clergy of the Diocese. The Rev C.O.Kenyon returned thanks. D.F.Atcherley,Esq. ;proposed the Army,Navy,Yeomanry Militia and Volunteers ,coupling with the toast the names of Colonel Kenyon Slaney, Major Rowland Kenyon, Sergeant Major Morris, Captain Fenwick and Lieut Percival ( Applause ). Colonel Kenyon return thanks on behalf of the Army. After detailing the recent achievements in Abyssinia. Major Rowland Kenyon on behalf of the Militia; Captain Fenwick for the Navy; and Lieutenant Percival for the Volunteers, then briefly returned thanks (Applause). The Chairman then proposed the health of their respected Vicar, the Rev. F.P.Wilkinson. The toast was drunk with three cheers and one more for Mrs. Wilkinson and her family). The Rev.F.P.Wilkinson returned thanks on behalf of himself and Mrs. Wilkinson and family. He referred to the great kindness of the late Rectors wife (Mrs. Evans) who left a sum of money for the organ; and to return his thanks to Mr. Minton for his exertions on behalf of the three additional bells; to Mr. Pountney Smith their Architect; to Messrs Evans and Morris for the heating apparatus in the church; to Mr. Kenyon for his invaluable assistance; to Mr. John Basnett, Mr.Oswell, Mr. Stokes and others; To Mr. Norris of London who had presided at the organ that day & proposed the health of the Churchwardens and the Committee of Management. Mr. Basnett briefly returned thanks. Colonel Kenyon Slaney proposed “Success to Agriculture “and coupled it with it the name of John Humphreys Esq. of Hanley Hall. T Humphreys Esq. returned thanks and proposed the health of Rev. W.Jones of Baschurch , who returned thanks . The Rev.F.P.Wilkinson proposed the health of the Chairman J.E.Kenyon Esq. and the Hon Mrs. Kenyon of The Pradoe and Family. The Chairman feelingly and appropriately, responded. The Rev W.Gibson Proposed , The Ladies. Mr. Shaw responds. Ruyton Towers The Hunt Window, in memory of 4 children from Park House.